Memristive Nonlinear Electronic Circuits deals with nonlinear systems in the design and implementation of circuits for generating complex dynamics. The brief proposes a new memristor model using an inverse tangent function, which achieves the characteristics of the memristor and can be implemented easily because it corresponds to the bipolar transistor differential pair. The authors design a new model-based memristive time-delay system by obtaining a time-delay memristive differential equation, which can generate an n-scroll chaotic attractor by adjusting the proposed nonlinear function. These designs are carried out using OrCAD-PSpice. The brief also presents a new time-delay memristive circuit excited by a nonautonomous staircase function which can generate grid chaotic attractors: new families of grids of n×m-scrolls. For increasingly complex dynamics of the circuits, the authors propose a new five-dimensional autonomous system with two memristors. The dynamical characteristics are investigated by phase portraits and bifurcation diagrams. The brief applies two synchronization methods to the memristive circuits: PC synchronization, and feedback control synchronization. 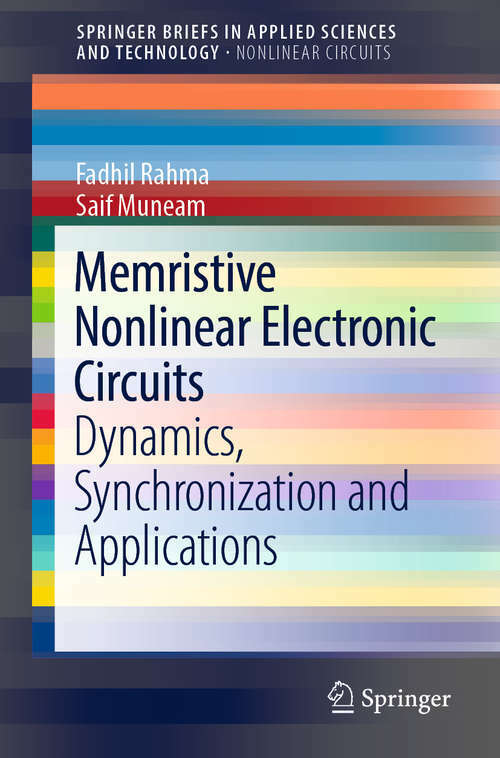 The authors consider synchronization as the idea underlying idea the applications in nonlinear electronic circuits. Finally, the double-memristor system is employed to give rise to a highly secure dual-stage encryption technique.